The question of which car polish to use is a common one for car owners, but polishing itself will damage the finish of a car and should be avoided. Of course, the most important part of keeping a car’s finish looking beautiful is a flawless paint detail, but once this is done, proper care is essential. Preserving your homemade electric car’s clear coat keeps the finish deep, and treating individual spots keeps that clear coat from being damaged over the entire body of the car. Many do-it-yourselfers buy multi-step car polishing packages and apply all steps to the entire car, simply because the manufacturer of these products recommends it. This is not a careful or correct way to do detail work. Tip 1 – Start with the least damaging treatment. With few exceptions, most paint problems only require the proper skill and equipment, along with the finest polish available. Harsh treatments should be a last-line strategy. “Pre-wax cleaners” are gentle polishes that shine a car’s surface without digging into the paint. P21S Paintwork Cleansing Lotion and Klasse All-In-One are two of the best. These polishes work through a chemical cleaning process, coupled with an extremely fine abrasive powder. Tip 2 – The topcoat is precious. The main qualities of a car’s finish are clarity, depth and gloss. Scraping off this clear coat with a harsh polish may add gloss in the short-term, but when the clear coat is damaged, permanent harm is done to the depth of the polish, and the small scratches reduce clarity. Serious car polishes are not meant to be used at-home by car owners. Without a rotary polisher, operated by a professional, these polishes will destroy the clear coat. These scratches in the finish cannot be removed through additional polishing. Since clear coat is so crucial to a car’s finish, avoid anything that may thin it. An abrasive polish may quickly remove 1 – 2 thousandths of an inch of finish – a contemporary auto finish is between 6 and 8 thousandths of an inch thick. When fixing a scratch on your DIY electric vehicle, a temptation is to polish down the clear coat until the scratch is not visible. If this happens, then the finish of the entire surrounding area will be visibly different from the rest of the car. It would be better to gently lift the coarse texture of the scratch, and let some remain so that the finish stays consistent overall. The overall final result is more important than the dullness or scratches that are being polished out. Tip 3 – Use the right product for the right job. 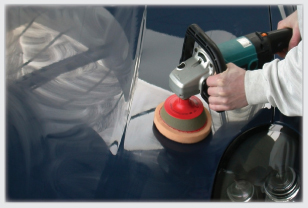 A polish designed for factory workers to remove scratches from preparatory sanding should not be used to remove minor swirl marks, especially not without careful adjustment of the time, pads and speed used to apply it. Some abrasives will cut less and less as they are used, others will simply continue scraping. A “general purpose” product may not be right for the job at hand, and choosing the right polishing pads and technique for it is another serious challenge.